At the start of a six day roadtrip I was heading down the Central Valley from San Jose in the morning with no intention of hiking in the Liebre Range that afternoon. I had had my eyes set on an unnamed P900 at the southern tip of the Tehachapi Mountains, exploring two options to reach it. Dirt roads lead to the summit from the west off Interstate 5 at Lebec, but most of this side is Tejon Ranch property and well-gated. There didn't seem to be any innocuous place to park the van and no easy way to walk in without the possibility of drawing undo notice. Unhappy with the options I found here, I then drove around to the east side off SR138, a longish detour to reach near the Oso pumping plant for the west branch of the LA aqueduct. This lone road has a few isolated homes, some aqueduct traffic and lots of sign to let you know you're not welcome. It doesn't help that the west side of the mountain is also the site of an active cement plant. I decided this might be best left as a night hike. But what to do with half a day I still had left? I recalled vaguely that I had not actually reached the P1K on Liebre Mountain, a long ridgeline running atop the Liebre Range just south of the Tehachapis. There are two closed contours about 3/4mi apart, with the HPS summit to the east alongside the PCT. Others have determined that the west summit is actually higher and while this has little bearing on the HPS list and their choice to represent it, it does place the prominence crown specifically on the west summit. I also knew that both summits are vaguely defined with poor views, so getting the right location was key. I was happy that I could get cell reception there on the edge of Antelope Valley along SR138 and pulled up the coordinate for the west summit from the Internet. Armed with this info loaded into my GPS, I headed up the Old Ridge Route where it branches from SR138. This old road is a small wonder in its own right. Connecting Santa Clarita Valley in the south to Antelope Valley and the Central Valley (through Gorman and Lebec) to the north, it was marveled as an engineering wonder when it was opened in 1915. It was supplanted by the old US99 (the Golden State Hwy) in the 1930s and then Interstate 5 in the 1960s. Portions of the Old Ridge Route are still drivable though the road is badly worn and potholed. Built primarily of concrete, it is impressive that it has lasted in these rugged hills after almost 100yrs. The first two miles north of SR138 are still maintained as far as the Quail Lake Fire Station and the junction with Pine Canyon Rd. At this junction there is a spur road, paved but poorly maintained that runs west up to the summit of nearby Bald Mountain. I managed to drive the van to the summit to add it as a bonus - the only summit I visited this day with a full view. There are several communications towers located here, the largest maintained by the City of Los Angeles for some nebulous "Internal Services Department" as depicted on a sign found there, complete with a bunch of politician's names who probably voted for the construction funds but otherwise had little to do with Bald Mtn. Back at the Old Ridge Route, I drove about a mile further on the unmaintained portion heading south before deciding it was too rough for my van. Several miles further along is a junction with a dirt road leading to the summit ridge of Liebre Mountain, allowing those with sufficiently muscled motor vehicles to make a drive up of it. I would not be joining that crowd. Instead, I noted an old fire road running up the northwest side of the mountain and decided to use that as a way to reach the summit ridge. (As an aside, the shortest route to both the east and west summits without a high clearance vehicle is actually up the PCT further east along Pine Canyon Rd. I chose to approach from the west since I'd already been up the PCT route back in 2005.) After starting up the fire break I noted that there is also a single track trail that winds its way up the side in a much more elegant manner. It appears open to motorcycle traffic, but it must be a tough ride with encroaching brush in places that makes getting handlebars through a real challenge. I used the steep fire break for the ascent and the switchbacking single track on the way back. 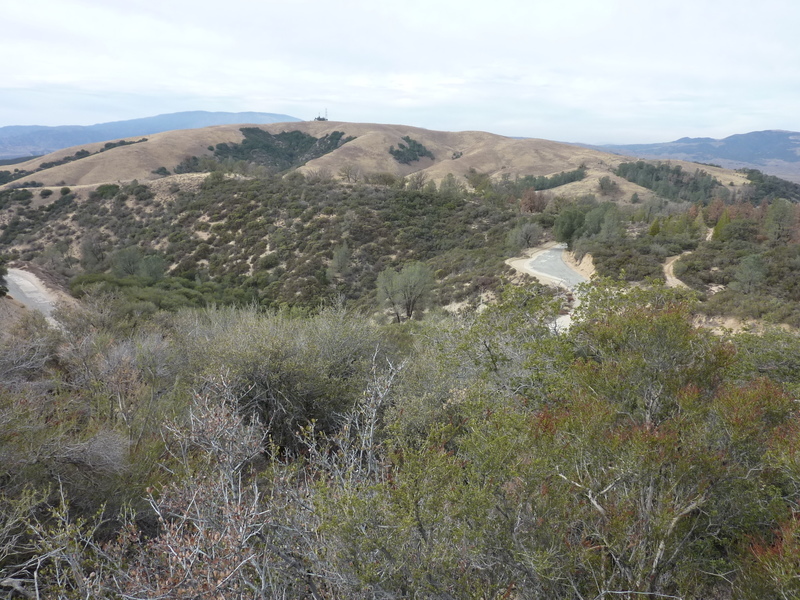 Just before reaching the ridgeline, I turned left off the fire break where the single track trail crossed my path. I followed this rather than the more mundane road for more than an hour, a scenic tour through varying terrain of oak woodlands and thick chaparral with periodic views off the north and south sides. It took about an hour and a half to reach the west summit. As expected, it was not obvious, and I first followed some old blue flagging to a clump of brush further west before finally making my way to the actual highpoint. Richard Carey had left a register in 2006 with 16 pages now filled. How Richard Carey and party managed to use a sight level to determine the highpoint was a bit of a mystery (or rather, a degree of surveying skills I didn't possess). I decided it was worth visiting the HPS summit to the east to see what difference my GPS could ascertain. Though I didn't have the HPS summit coordinate, I was able to find it without much trouble at all, relying on my 10yr-old memory from the previous visit. 15min later I had found the small cairn just off the PCT with another register, this one left by a Mars Bonfire party in 2010. Half the entries on the three pages were repeat visits by Mars. Again there were no views to be had, but even if there were I'd have been out of luck as I found myself enveloped in a cloud layer hanging over the higher elevations. Temperatures were dropping and would be in the 40s before I returned to the van. I checked the GPS at the HPS summit and then again at the west summit on my return and determined that the west summit appears to be about 10ft higher - pretty much in line with what others have found.